ARMORED SAINT Stream New Track "Mess"
Los Angeles, California's b>ARMORED SAINT are set to release their seventh studio album this summer. The album, Win Hands Down, is all things armored, a vintage crush of classic power propelled by a cathartic blast of life in the year 2015. The album is scheduled for release on June 2nd in North America, with release dates for June 1st in Europe/UK, and May 29th in DE/CH/AT. ARMORED SAINT has debuted their brand new track, “Mess”, and you can check it out below. John Bush (vocals) states: “Powerful music required some powerful lyrics. It was made clear by the chanting sounds of the tribal groups at the beginning of the song all the way to the frantic chorus. It sounded like chaos. 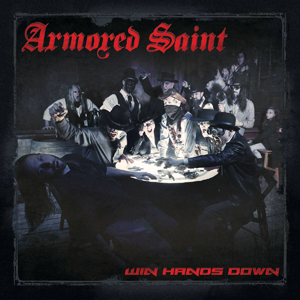 Possibly the heaviest song ARMORED SAINT has ever written. "I continue to marvel at the amount of garbage that’s created on our planet. Whether it’s food or other disposable items. We could blame groups like Monsanto and that would certainly be valid, but it all comes back to personal accountability. We could all do better. Waste dirty’s up our beautiful cities and planet. We’re consuming maniacs. All you can eat buffets offered to a third of Americans who are obese doesn’t make a whole lot of sense. That is unless were trying to kill ourselves. What a mess." A brand new video was recently shot by director Andrew Nethery, and is available for viewing now at metalblade.com/armoredsaint, where album pre-order bundles are also ready for order. Win Hands Down - mixed by Jay Ruston, produced by Joey Vera. "That Was Then, Way Back When"
"With A Full Head Of Steam"
ARMORED SAINT are also proud to be joining the legendary SAXON for a few select, high profile shows across the country from May 12th through May 30th. Head over to facebook.com/thearmoredsaint for all tour dates and additional information.